Celebrate the RESURRECTION! of our SAVIOR! so we can live for ETERNITY! Those words are too important to just pass over with an egg hunt and a new dress. It means everything to me, and I didn’t want to minimize it with a secular bunny and eggs. Before I lose you, the Bradys do color eggs – if I get them in time – and hide them in a fun tradition that spills into homeschool hunts during the spring. But I fail at decorating my house for Easter, and every year I intend to send out Resurrection cards instead of Christmas cards…which have yet to get done…because without Easter, Christmas is nothing. It is that monumental, so I thought I would tell of some ways that people have shared with me to teach children the REAL meaning in a fun and memorable way. This was introduced to me by my dear friend, Carmen Madler. Her idea begins each year by taking their Christmas tree, cutting off all of the branches and saving part of one to use as the cross bar. 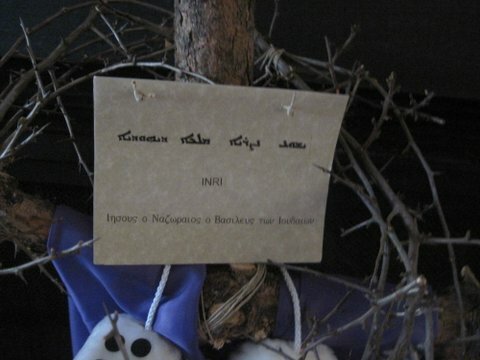 For the 40 days and nights before the resurrection (signifying Jesus’ time when he was led by the Spirit to the wilderness to be tempted by the devil, Matt 4:1-2), the Madlers tell a part of the story and place something on the tree: the crown of thorns, the sign which says, “King of the Jews“, the dice (signifying the “lots”) that the soldiers cast to try to win Christ’s clothing, etc. I love this idea, since it links the meaning between the two biblical events: Christ’s birth and resurrection – in a visual way that children will remember. Of course, the decoration in the home is a constant reminder for adults as well. 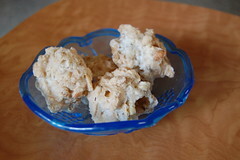 The Night Before Easter: Make these cookies, and be sure to read the Bible passages! Place pecans in zipper bag and let children beat them with the wooden spoon to break into small pieces. Explain that after Jesus was arrested, He was beaten by the Roman soldiers. Read John 19:1-3. Let each child smell the vinegar. Put 1tsp vinegar into mixing bowl. Explain: When Jesus was thirsty on the cross, He was given vinegar to drink. Read John 19:28-30. Explain: Jesus gave His life to give us life. Read John 10:10-11. Explain: This represents the salty tears shed by Jesus’ followers, and the bitterness of our own sin. Read Luke 23:27. So far, the ingredients are not very appetizing. Add 1 cup sugar. Explain: The sweetest part of the story is that Jesus died because He loves us. He wants us to know and belong to Him. Read Psalm 34:8 and John 3:16. Explain: The color white represents the purity in God’s eyes of those whose sins have been cleansed by Jesus. Read Isaiah 1:18 and John 3:1-3. Explain: Each mound represents the rocky tomb where Jesus’ body was laid. Read Matthew 27:57-60. Put the cookie sheet in the oven, close the door and turn the oven OFF. Give each child a piece of tape and seal the oven door. Explain: Jesus’ tomb was sealed. Read Matthew 27:65-66. Explain: We may feel sad to leave the cookies in the oven overnight. Jesus’ followers were in despair when the tomb was sealed. Read John 16:20 and 22. On Easter morning, open the oven and give everyone a cookie. Notice the cracked surface and take a bite. The cookies are hollow! Explain: On the first Easter, Jesus’ followers were amazed to find the tomb open and empty. Read Matthew 28:1-9. Sing Christ the Lord is Risen Today! Eat the cookies before church:)! Plastic eggs have never had such valuable content! I didn’t realize Resurrection Eggs could be bought when I first heard of the concept, so I made them out of my own dollar store plastic eggs, a twisted paper clip crown, a rock from the yard, cotton ball with vinegar, etc. 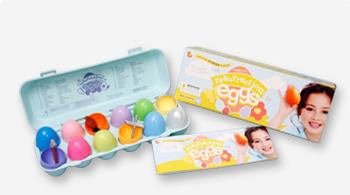 Whether you hide these in the yard or house, or read through the passages as you each open an egg at the dinner table, the children stay in full attention, waiting to see what will be revealed inside of the next egg. Of course, the last egg is empty, signifying the empty tomb – and the sigh can be heard from every mouth as their hearts are pulled to thoughts of the Savior. May you be blessed with a family week of celebrating the Resurrection of the Savior! This entry was posted in Motherhood, Rooted in Faith, Uncategorized and tagged Bible, Christian Easter for children, Easter, Jesus, resurrection by Terri. Bookmark the permalink. Great ideas to make memories at Easter. 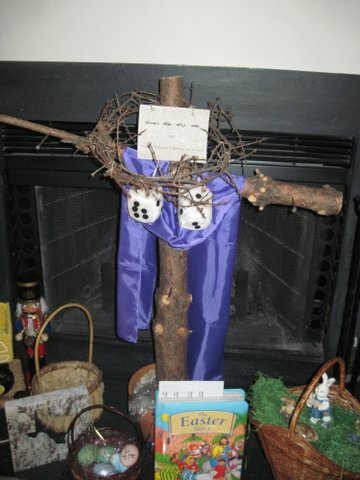 We have so many Christmas traditions, which are wonderful, but how nice to see Christian parents developing Easter traditions that teach the real meaning of the resurrection. What fantastic ideas Terri! I look forward to implementing these creative lessons! As always, thank you for sharing and for all that you do! Love ya! Thank you for sharing those awesome family traditions! It is incredibly important to keep our kids (and ourselves) grounded in the true meanings of our holidays and celebrations. For Easter, one of the things our family has done for several years is to attend a Seder at our church during Holy Week, on Wednesday. The entire Haggadah (Seder order of service) is read in English (though there are a couple of attendees who know Hebrew and do a few of the prayers in that lovely language). It is a Christian Seder, so everything is explained in light of the Gospels and the Passion of our Lord. Thanks Terri for all the great ideas. I was just asking Jim last night for ideas on how we can make Easter more about the true meaning other then just getting dressed nice for church. And I checked my email and you had posted this:) God is good!!! Thanks Terri! Beautiful ideas for celebrating Resurrection Sunday!!! LOVE this Terri!! As parents of an almost-three year old daughter, we have already seen the strong push from society to eliminate Christ from Christmas and Easter and lure her in with candy, new toys, Santa Clause, the Easter Bunny, etc, etc. It takes a lot to combat all that and keep her reminded of what we are truly celebrating. Thank you so much for the great ideas that we can incorporate into our family traditions as we seek to life up Christ in a secularized world. I remember making Resserection eggs for my kids when they were little. They became availible a few years later at our local Christian bookstore. Love the additional ideas! Will keep for when I have grandchildren (not in any hurry!) Thank you! What fantastic ideas to celebrate the true meaning of this holiday! Thank you Terri for always helping with ways to improve. I will definitely be doing some of these this year! My mom did resurrection eggs and hollow cookies when I was a kid. Definitely traditions worth passing on! What beautiful traditions, Terri! Thank you for the good ideas. Now I just need to find some little ones to share them with. (My children are all grown, now.) Good thing the nieces and nephews are still young! May your Easter be beautiful as you celebrate His victorious Ressurection! That is AMAZING!! I love how with everything you do, you always keep your eyes on Jesus and are an wonderful example to your children! Thank you for always sharing such wisdom and I hope you and everyone else has a blessed Easter! Thank you Terri! Love these new ideas especially with curious 5 and 2 year olds! Our family has been trying to stay true to Easter and biblical traditions rather than new traditions (especially when Easter is this Sunday…it is still Lent right?!). For the second year in a row we’ve made Jesus’ tomb from terracotta plate and small pot using soil and grass seed. It is fun to watch the grass grow…like a chia pet and then trim the grass. We also borrow a neighbor’s stone and roll it in front of the tomb on Good Friday, rolling it back on Easter Sunday. Thank you for sharing the love and blessing of Easter. God Bless you and the Brady family this Easter and always. Fun!! I’m going to do the cookies , thanks for sharing that and exposing the silly rabbit ! Jesus is Lord ! He is Risen ! Awesome Terri! I have a friend/teammate who celebrates both Christmas and Easter in a similar fashion with her family. She says, “I want my kids to know who we worship during these important holidays, Jesus Christ… not Santa Claus and the Easter bunny.” Thanks for the reminder! Terri! I love alll the ideas you have shared! I cant wait to make the cookies together! He is RISEN INDEED! Terri, thank you for all the wonderful ideas. I was just struggling with how to celebrate Easter minus the bunny, and here again God is working through you to provide the answer I need. Your blog is amazing! JESUS IS LORD!!! Terri, thanks for sharing HE IS RISEN INDEED !!! We made the cookies this year. I read this blog earlier in the week and then on Good Friday our church nursery handed out the recipe too….what a great tradition to start. Thank you for the suggestions! Love these ideas Terri…especially the tree. Wish I had them when my kids were younger but will still use and share them. Thanks! Wow! That is inspiring Terri. God has blessed you richly with knowledge. What great ideas, Terri! As always, thank you so much for taking the time to share! My husband and I were just talking about this yesterday when I came across this article. How fitting. Thank you for sharing your traditions. These are excellent ideas to merge“the world” with the truth and significance of the holy celebration.